And vying for the longest four minutes of my life....today we finally have a reason to put into use our Emergency Metro Protocol. Growing up, I remember that every place we went -- every store, festival, amusement park -- the first thing we would do when we arrived was come up with a meeting spot in case we got separated. There was always a plan: e.g. Meet at the big information booth in front of the roller coaster on the hour. This was before the days of cell phones, of course. One would assume this was to keep my brother, sister, and me from getting lost, but in fact it was generally because my dad would wander off to take pictures of something that interested him (which is everything) and lose the rest of us. So with my family training, one of the first things I did when we moved to Paris was come up with an Emergency Metro Protocol. I drilled the girls on it so much, they would groan when I even brought up the subject, but I wanted them to do it reflexively when the occasion arose. I say "when" and not "if" because, really, it seemed inevitable to me that one day we would be separated getting on or off the metro. The doors close mercilessly here and so there had to come an occasion when either I am separated from the girls or one of them is separated from the rest of us. The Emergency Metro Protocol is this: Whoever is on the train -- either because they didn't get off quickly enough or were the only one(s) who made it on -- gets off at the next stop and waits in that same spot, at the same door, for the next train. There are not express/local trains to worry about. Those left behind get on the next train and catch up. Even if we have to go the wrong direction, or leave the station that is our actual destination, that's the plan. The girls seemed pretty excited to lose me.....until it was the real McCoy. On our way to gymnastics, Pippa gets on first, and the train is not making the buzzing noise that warns the doors will soon close. I am partway on the train just as I hear an unusually anemic buzz, so low I'm not even sure it's for our train, but I turn around to see how far behind us Gigi is. She's walking slower than usual because she's a little sick, and in that moment of my hesitation, the door closes. As 95% of me is still on the platform, I have no choice but to pull my foot out and watch as Pippa -- then just barely seven-year old -- goes off on the Paris metro. Alone. Usually, the next train comes within two minutes. Often, it comes within one minute or less. But Murphy's Law goes into effect, and this time there is a four minute interval. I have friends here who say they teach their daughter to stay put if they get separated, which is fine normally when you can retrace your steps and are not on moving vehicles. But I'm trying to convince them that wouldn't work if she's the one on the train. Does "stay put" mean she should stay on the train to who-knows-where? Or find her way back by herself on the metro? No. Our Emergency Metro Protocol is a simple but elegant solution, because otherwise we would be panicking and running around wondering who is going to whom. In some stations, it can be very complicated to find the train going in the opposite direction (and may even require a new ticket), and it's clear to me that backtracking would make it more difficult and take longer to reunite. I see through the window that Pippa has a slightly worried face as she goes off alone, and she says she gets some stares on the train and when she gets off alone and waits on the platform. While we wait, Gigi tries to ask about an ad she sees, and I have to say, "I can't concentrate on a thing you're saying. I'm just watching the clock and breathing and assuring myself it will be OK." Gigi is totally confident. "Pippa knows what to do. She's going to do the right thing." And I agree with that, with 100% confidence. What Gigi doesn't know that I do, however, is that there are some weird people out there....But still, it seems pretty safe having Pippa stay on the platform, in full view, and she absolutely knows that she is not to go anywhere with anyone. If somebody wants to stay with her to make sure she's OK till I get there, she can't stop them (and, frankly, if I saw a small child alone, that's what I would do as a stranger), but she is not to leave that spot. Indeed, when our train pulls into the next station, four loooooooooong minutes later, she is leaning against the wall. She buries herself in my chest for a while and cries a little, but I am so proud that she does just what she should do and holds it together while necessary. Yeah for the Emergency Metro Protocol and for Pippa -- our successful independent urban seven year old! Saint Paul is a mild raw milk goat's cheese from Poitou, on the Atlantic Coast in central France. It's a semi-soft cheese -- basically firm to the point of crumbly, yet it melts in the mouth, and it comes in a gorgeous white disc the size of a hockey puck. At a cheese-tasting party, my friend Kim describes the creaminess as being like "peanut butter on the roof of my mouth." Our friend Michelle then tries to forbid me from using the peanut butter analogy on the blog, because it will bring down the tenor of my writing. Then again, she doesn't know that I'm also comparing it to a hockey puck. Perhaps Michelle is giving me too much credit for being classy. To be clear, it doesn't taste like peanut butter or a hockey puck, mind you, but it's a kind of creamy that does stick your mouth together. Have liquids on hand. The taste is very mild, with a hint of sweetness that makes you remember that milk is full of natural sugars. And to boost the sweetness, it tastes extra delicious with a drizzle of honey, in the tradition of other little goat cheeses like Rocamadour. It's a popular cheese on the platter. 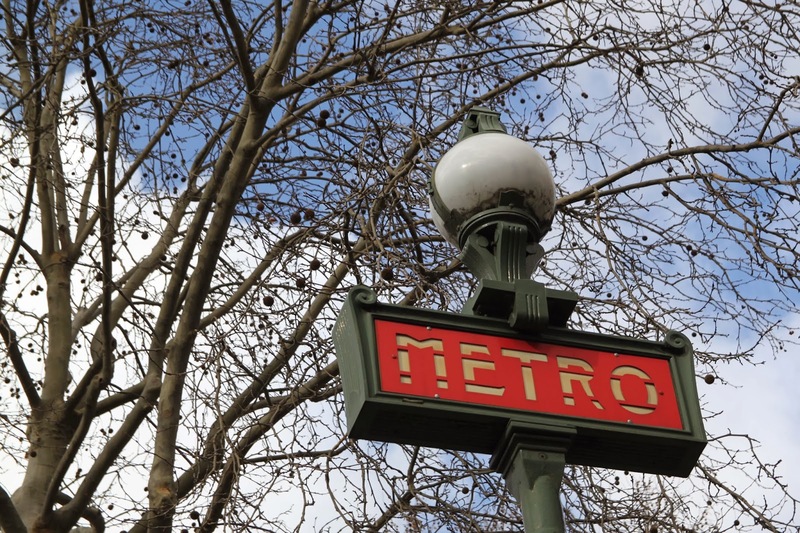 Saint Paul is one of the metro stations that we use the most frequently, since it's located near our house in the Marais. We're often headed from Saint Paul station on the metro to get somewhere or toward Saint Paul station to get back home.